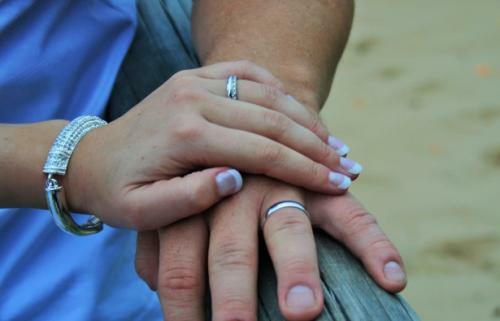 Offering your spouse what you believe to be positive support could have negative physiological effects on them, according to new research from Binghamton University, State University of New York. A team of researchers from Binghamton University recruited sixty-five married couples and had them engage in two interactions in which each spouse selected a discussion topic about a stressor external to their marriage (e.g. poor physical fitness, the desire to get a new job). Before and after the interactions, spouses separately completed questions about their expectations and appraisals of their partner's responsiveness during the discussion. The researchers took saliva samples from each spouse and measured for cortisol—a hormone that helps regulate stress in the body—at the beginning of the study and after each discussion. The most consistent finding was that observable behaviors when support was given and received during discussions of wives' stressors were associated with wives' perceptions of their husbands' responsiveness and wives' changes in cortisol. "What we found, interestingly enough, was that cortisol was really only affected in wives but not in husbands, and only in wives' discussions," said Hayley Fivecoat, a former Binghamton University student who published the results in her dissertation. "For one, we did find that when husbands showed more positive behaviors while they were giving support, wives' cortisol actually went down. Interestingly, we found that when wives showed more negative behavior while their partner was giving them support, their cortisol also went down. That was unexpected. We found that when wives showed more positive behavior while they were receiving support, their cortisol actually went up—they showed signs of more physiological arousal." While communication skills are often the focus of many clinical interventions, the study suggests that skill in delivering and receiving social support (by using more "positive" support behaviors) is not consistently linked to actual reductions in cortisol, nor increases in perceived partner responsiveness, said Fivecoat. In fact, more positive behaviors may have unintended negative consequences, and classically defined negative behaviors can sometimes have positive effects. "Say a husband is giving advice to his wife when she has a problem. Even though giving advice is a constructive thing to do, it may not be helpful to her at the moment; maybe she just wants someone to listen to her," said Nicole Cameron, assistant professor of psychology at Binghamton University and co-researcher. "Or maybe there could be the opposite, where the husband is being more of a supportive listener but the wife really wants someone to give her some advice. All of those things are positive, but one is going to have a better effect than the other. What this tells me is that social support is more idiosyncratic and specific to the person and the problem." In helping couples support each other, clinicians may work together with couples to identify the ways they prefer to be supported in order to capitalize on the positive effects of perceived partner responsiveness on relationships, said Fivecoat. This may be a more fruitful approach than advocating for more general positive and negative communication behaviors while giving and receiving support. "Perhaps clinicians can highlight the positive intentions of support givers to elicit greater perceptions of understanding, validation and caring from supportive partners. By highlighting intentions of support givers, the effects of more positive behaviors could be enhanced, and the costs of more negative behaviors could be mitigated," said Fivecoat. "Ultimately, a clearer understanding of social support processes, including what is effective in reducing physiological arousal, will allow couples to capitalize on the association between social support and marriage, and reduce the impact of stress on health." The researchers plan on looking further into the data and publishing more findings in the future. "I think that there is a lot of research that still needs to be done, because not everybody gets out of counseling feeling better," said Cameron. "So studying what makes people feel better or feel differently is important, and using hormones as a marker of the change is interesting because it goes further than words—you really can see how the body reacts to discussions. If we can figure out how to use these markers, we probably can really improve our knowledge about counseling and couple communication." Other Binghamton researchers to contribute to this research include Matthew Johnson, chair and professor of psychology; and Richard Mattson, associate professor of psychology. Cameron's dissertation was titled "Spousal social support is associated with perceptions of partner responsiveness and fluctuations in cortisol for married women."